With the adjustable stand option, the Carbolite HTRH-GR Graphite Tube Furnaces can be used at various angles, ranging from horizontal to vertical. This range of cold wall tube furnaces is heated by graphite elements and insulated by graphite felt. At higher temperatures above 400 to 600 °C graphite is air sensitive and needs to be kept under either an inert gas or vacuum atmosphere. 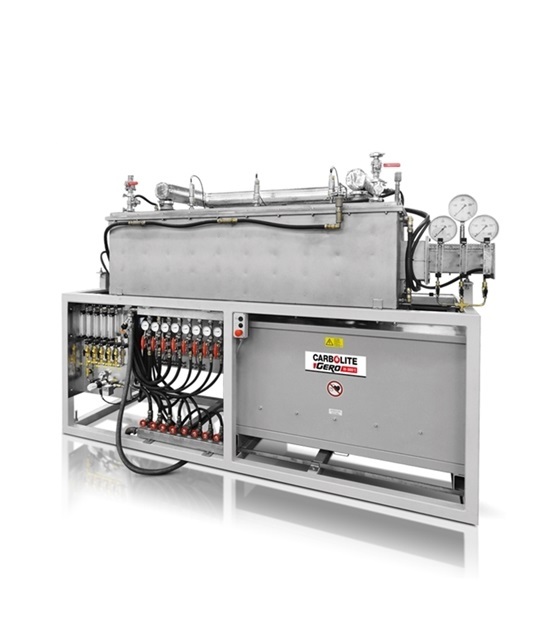 To maintain an oxygen free environment, the tube furnace is contained within in a water-cooled vacuum tight vessel sealed with rubber O-rings, which needs to be evacuated and purged with inert gas prior to heating. The thermal conductivity of graphite felt insulation is very low making it an excellent material for furnace insulation. The thickness and quality of the insulation materials are specifically chosen depending on the maximum operating temperature of the tube furnace.